AIMC setup was laid down in 1975 under Bhutto regime. It initially operated with limited funding and scarce resources with no teaching hospital. Allama Iqbal Medical College Lahore flourished slowly under highly qualified administration and capable faculty, and now it is one of the most reputed medical colleges in Pakistan. As of 2016, the total area of Allama Iqbal Medical College is 105 acres with dozens of departments and thousands of students from all of Punjab and federal territory. The Foundations of College were laid by the then Prime Minister Zulfikar Ali Bhutto. The name initially given to the college was Lahore Medical College; it changed after a couple of years giving a tribute to nation’s thinker and philosopher Allama Iqbal. The college offers undergraduate, post-graduate, nursing and medical technician courses to its students. The Allama Iqbal Medical College is located on the Canal, Lahore. The 105 acres of land houses several buildings including offices, residential blocks for employees, hostels for both boys and girls students, a well-equipped library, computer labs, mechanical rooms, and auditoriums. The theater lecture rooms provide adequate room for a maximum number of students with a clear view. The facilities are up-to-date with modern laboratories, sophisticated electrical equipment for performing medical and technical experiments and analysis with highly capable faculty and lab staff helping students whenever they want. 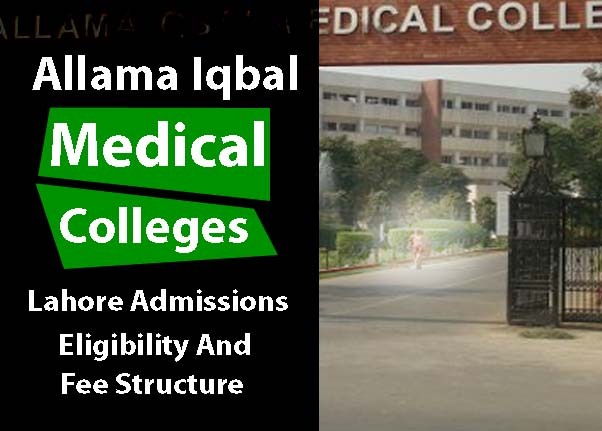 The exact location of Allama Iqbal Medical College for submission of admission forms and other queries is Allama Shabbir Ahmed Usmani Road near the canal adjacent to Jinnah Teaching Hospital Lahore. The campus has every sports facility along with the educational excellence offered for the last 40 years. It has gyms, swimming pools, cricket & football grounds, indoor gaming courts, and an auditorium with a capability to facilitate 1500 students at a time. Admissions are opened once all the boards of intermediate education announce their results for FSc. Pre-medical for the educational year. The admissions held every September; the students are asked to get a prospectus for admission worth Rs. 500 and send it to the campus location. As Allama Iqbal Medical College is a public medical college, so the admission criteria are handled by University of Health Sciences. The MCAT entrance test is conducted every September/October, and the passed candidates are then asked to submit their verified documents to the main campus. The admissions for MBBS and Dental Sciences (BDS) are announced after the FSc. Results, the students enrolling for nursing sciences and technical education may have different admission dates. Post graduate admissions are announced in February every year whereas the commencement of classes takes place on April, there are a separate block and research center, laboratories for students pursuing specialization degrees in medical and clinical sciences. AIMC educational blocks are divided into two sections, basic sciences departments and Clinical Sciences. The basic sciences department is for first, 2nd, and 3rd-year undergraduates. It is further sub-divided into seven functional units. The departments of Biochemistry, physiology, pathology, anatomy, pharmacology, and Forensic & community medicine departments. Every unitholds at least one professor, associate and assistance professors, and demonstrators. The department of clinical sciences is for advanced medical studies; it is the largest operational unit of AIMC. The departments of medicines, pediatrics, cardiology, radiology, oncology, and radiotherapy are housed in the Clinical block. The faculty of surgery has twelve additional units with advanced courses for undergraduate and postgraduate students. The eligibility criteria are determined by Pakistan Medical and Dental Council as directed by the ministry of health and education for all the public and private medical colleges of Pakistan. The candidate must acquire at least 60% marks or 660/1100 as the standard marks sheet criteria say, the student must have a regular college degree of FSc. Pre-Medical with Physics, Chemistry, and Biology as core subjects. The distribution of marks and the preparation of aggregate for all the universities according to the rules and regulations of HEC are 10% marks in matric, 40% marks in FSc. Pre-Medical and 50% marks in the total aggregate consist of Entrance Test or MCAT scores. Once admitted, the student must score and maintain a minimum 60% in all the academic years, If a student fails to keep up to the criteria, the university is liable to strike off the name of the student from the list after a probation period if performance not shown at that time. As one the toughest field in higher education in Pakistan, Private Medical colleges are making hundreds of million annually from their students to complete the degrees with incomplete faculty and machinery with no plans to accommodate their students in reputable hospitals. The fee structure is high enough to make most of the middle-class aspirants to change their decision to become a doctor or a dentist. However, in Public Medical colleges and universities, the fee structure is low, but the competition for securing admission is 100 times tougher and tiresome than Private institutes. Also, the government colleges offer a secure future with certain job opportunities in government-run teaching and general hospitals. As a public medical college, the government offers a full subsidy in fees of selected medical students. As compared to the PMDC regulated fee structure of private institutes with Rs. 600,000 annual fee that reach Rs. 900,000 per annum added taxes, admission charges,etc., the cost of study in Allama Iqbal Medical College and other public hospitals is as low as Rs. 20,000 per annum. The hostel charges absent mess fee sums up to Rs. 50,000 per year. Multiple teaching hospitals and research organizations are attached with Allama Iqbal Medical College. The primary affiliation of Allama Iqbal Medical College is with Jinnah Teaching Hospital adjacent to AIMC; it is a part of AIMC with 1250 beds including emergency, surgical, cardiology, general sciences, dental, and radiotherapy departments. An estimated 800,000 patients receive treatments from AIMC every year. The other affiliates are PMDC, UHS(University of Health Sciences), Physiotherapists College,Mayo Hospital, Riphah Medical College, and Riphah College. The college is also in partnership with School of Allied Health Sciences for nursing and technical assistance.